I have been attending this event for the last 3 years. Every year this is one of my all time favorite events. Its a great event for an amazing cause. I hope to see you there. 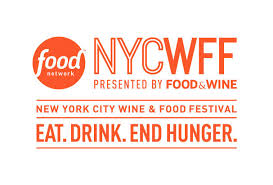 The Food Network New York City Wine & Food Festival presented by FOOD & WINE and Founder and Director Lee Brian Schrager are pleased to announce the program of events for the seventh annual Festival, taking place October 16-19, 2014. Featuring more than 100 dinners, tastings, parties, seminars, and more over the course of four days, this year’s Festival will showcase the expertise of more than 350 of the world’s best culinary and wine and spirits industry leaders. All proceeds from the Festival benefit the nation’s leading hunger relief organizations, No Kid Hungry and Food Bank For New York City, for which the Festival has raised more than $7.5 million to date. Anchoring this year’s Festival program are more than 25 intimate dinners planned as part of the Bank of America Dinner Series, featuring a delegation of renowned chefs from all corners of the world. Talent highlighted throughout the series will include: Philippe Baranes, David Bouley, Dario Cecchini, Dominique Crenn, Kobe Desramaults, Alain Ducasse, Christopher Kostow, Ori Menashe, Enrique Olvera, Yotam Ottolenghi, Michel Richard, and many more. There will also be a special dinner on Wednesday, October 16 to celebrate the 40th anniversary of the renowned Le Cirque restaurant, hosted by 2014 James Beard Foundation Lifetime Achievement Award recipient Sirio Maccioni. A selection of brand new events has been added to bring fresh new flavors and experiences to even the most discerning palate. Guests can enjoy Hot Dog Happy Hour with Mo Rocca, Dominique Ansel’s Wonderland, Ample Hills & Brooklyn’s Best Dessert Party, Down-Home Country Brunch hosted by Trisha Yearwood, Delta presents Food with Altitude featuring its Culinary Captains, and the MasterCard Priceless Exclusive opportunity to purchase tickets to Rachael Ray’s Feedback™: Chefs and Cocktails. The Festival is also collaborating with Meatopia founder Josh Ozersky to close out the weekend with Meatopia X: The Carnivore’s Ball hosted by Michael Symon. The meat-centric event features some of the world’s greatest chefs cooking beef, pork, lamb, poultry, and wild game over live wood fires; and of course, as in Meatopia’s past, celebrity butcher Pat LaFrieda will cook and serve a one thousand-pound steer. Another popular event returning with expanded allure is Cooking Channel presents Chicken Coupe hosted by Whoopi Goldberg, in celebration of Schrager’s newly-released Fried & True: More Than 50 Recipes for America’s Best Fried Chicken and Sides (Clarkson Potter; May 2014). New this year, Chicken Coupe will feature award-winning cocktails from the mixologists at The Dead Rabbit alongside everyone’s favorite indulgent fried chicken offerings. Also back in 2014 are coveted experiences like Celebrity Cruises® Wine & Pairing Seminars hosted by FOOD & WINE, The New York Times’ star-studded Times Talks, unique hands-on sessions at the Home Studios, Master Classes at the International Culinary Center, and more. The entire line-up of events for the 2014 Festival can be found at nycwff.org. The Food Network New York City Wine & Food Festival is hosted by and benefits the Food Bank For New York City and Share Our Strength’s No Kid Hungry® campaign, 100% of the Festival’s net proceeds go toward helping these community based organizations fight hunger. Southern Wine & Spirits of New York is the exclusive provider of wine and spirits at the Festival. More information about the Festival can be found at www.nycwff.org. Food Bank For New York City recognizes 31 years as the city’s major hunger-relief organization working to end food poverty throughout the five boroughs. As the city’s hub for integrated food poverty assistance, Food Bank tackles the hunger issue on three fronts — food distribution, income support and nutrition education — all strategically guided by its research. Through its network of community-based member programs citywide, Food Bank helps provide 400,000 free meals a day for New Yorkers in need. Food Bank’s hands-on nutrition education program in the public schools reaches thousands of children, teens and adults. Income support services including food stamps, free tax assistance for the working poor and the Earned Income Tax Credit put millions of dollars back in the pockets of low-income New Yorkers, helping them to achieve greater dignity and independence. Learn how you can help at foodbanknyc.org. Really cool that you have been able to attend. Such a great cause!